'Prisoners' director Denis Villeneuve returns with a blisteringly suspenseful, ever surprising cartel thriller. Two years after making his U.S. debut with the crackerjack kidnapping drama “Prisoners,” French-Canadian director Denis Villeneuve ups his own ante with “Sicario,” a blisteringly intense drug-trade thriller that combines expert action and suspense with another uneasy inquiry into the emotional consequences of violence. A densely woven web of compelling character studies and larger systemic concerns, Villeneuve and screenwriter Taylor Sheridan’s bleaker, more jaundiced riposte to Steven Soderbergh’s 2000 “Traffic” may prove too grim and grisly for some audiences and too morally ambiguous for others. But with its muscular style and top-flight cast, this fall Lionsgate release should score solid (if less than “Prisoners”-sized) business from discerning adult moviegoers, along with dark-horse awards-season buzz. In a terrific performance that recalls the steely ferocity of Jodie Foster in “The Silence of the Lambs” and Jessica Chastain in “Zero Dark Thirty,” Emily Blunt stars here as Kate Macer, an FBI field agent who has been forced to don a Teflon exterior in order to rise through the Bureau’s male-dominated ranks, and to cope with the depravity she frequently witnesses in the line of duty. “Sicario” begins with one such grisly find: dozens of rotting human corpses hidden behind the drywall in a suburban Arizona home belonging to an arm of a powerful Mexican drug cartel. But the carnage doesn’t end there, and when the next round of violence erupts with startling force, it sets the apocalyptic tone for everything that follows. Indeed, the opening of “Sicario” unfolds at such an anxiety-inducing pitch that it seems impossible for Villeneuve to sustain it, let along build on it, but somehow he manages to do just that. He’s a master of the kind of creeping tension that coils around the audience like a snake suffocating its prey. Together with “Prisoners” and Villeneuve’s previous, Oscar-nominated “Incendies,” “Sicario” forms a loose trilogy about the politics of revenge and the value of a human life. But whereas those earlier films were panoramic in scope and choral in structure, “Sicario” unfolds almost entirely through the eyes of Kate, as she wades into the murky waters of an inter-agency task force assembled to give the U.S. a tactical leg up in the war on drugs. Helping to draw her in is Matt Graver (Josh Brolin), a sandal-clad, stoner-cadenced mystery man who claims to be a Defense Department contractor, though Kate and her partner (Daniel Kaluuya) suspect from the start that he could be CIA. Like more than one character in “Sicario,” Graver can claim almost as many identities as he can ulterior motives. Graver tells Kate that his operation needs her unique expertise, and while she isn’t fully convinced, she’s still young and naive enough to believe that there’s a right side in this war and that the U.S. is on it. Riding shotgun with Graver is another shadow man known only as Alejandro (Benicio Del Toro) — the “sicario” (a slang term for hitman) of the title — who is said to be a former Mexican prosecutor, and who has the solemn intensity of a man determined to get his way or die trying. “Nothing will make sense to your American ears, and you will doubt everything we do,” he tells Kate matter-of-factly on their first meeting — words that double as advice to the movie’s audience. The knotty plot that follows demands close attention but never becomes too difficult (or self-consciously opaque) to follow. 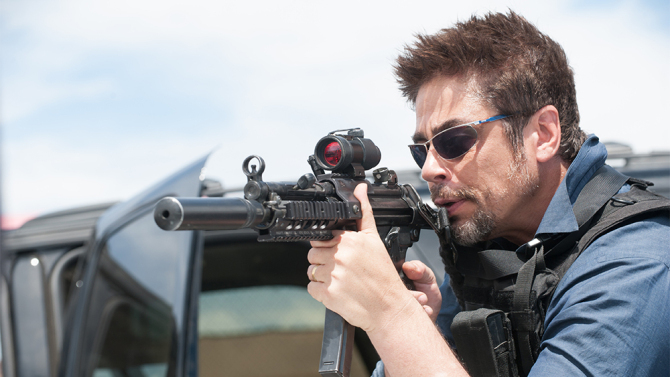 It involves multiple trips back and forth across the U.S.-Mexico border as the agents attempt to use one high-ranking cartel boss (Bernardo Saracino) to flush out an even bigger one (Julio Cesar Cedillo), though exactly why is a crucial detail “Sicario” holds close to the vest until late in the third act. In the meantime, Villeneuve stages one extraordinary suspense setpiece after another, starting with an epic traffic jam at the border that ensnares the Americans just as they are heading back home with a piece of very precious cargo in tow. Using no special tricks — just the sharp, color-saturated compositions of cinematographer Roger Deakins; the airtight cutting of editor Joe Walker; and the subtly menacing score of composer Johan Johannsson — Villeneuve creates a sequence as nail-biting as any “Fast and the Furious” car chase, except that here all the cars are standing perfectly still. As in the films of Clint Eastwood (whose “Mystic River” exuded an obvious influence on “Prisoners”) and Michael Mann, the violence in Villeneuve’s work is savage and startling, but never overstated or sensationalized, and every bullet fired ripples with consequences for both the victim and the trigger man (or, as the case may be, woman). Navigating the crossfire, Blunt is mesmerizing to watch, her intense blue eyes ablaze with intelligence as she tries to sort out the facts of the case from its attendant fictions, and whether Graver and Alejandro’s endgame justifies its ethically dubious means. Every bit as impressive is Del Toro, who has worked both sides of the street where cartel dramas are concerned (“Traffic,” “Savages”), but whose Alejandro is cut from considerably more complicated cloth. He is a swift, unforgiving man, with a wolfish jowl and the preternatural calm of the predator lying in wait. Yet he also shudders in his sleep, reveals flashes of battered humanity when one least expects it, and even, fleetingly, a Hannibal Lecter-ish lust for the flinty young woman thrust into his path. And as the film hurtles towards its climactic abyss, it is Del Toro who holds us rapt with a nearly silent performance that is the very embodiment of character through action. Working with a mix of technical collaborators old and new, Villeneuve has once again delivered an impeccably well-crafted film, not least in Deakins’ arresting widescreen lensing, which alternates between vast aerial canvases that capture the epic sprawl of the border land, and closeups so carefully framed and lit as to show particles of dust dancing on a shaft on sunlight. Reviewed at Dolby 88, New York, May 7, 2015. (In Cannes Film Festival — competing.) MPAA Rating: R. Running time: 121 MIN. A Lionsgate release presented with Black Label Media of a Thunder Road production. Produced by Basil Iwanyk, Edward L. McDonnell, Molly Smith, Thad Luckinbill, Trent Luckinbill. Executive producers, John H. Starke, Erica Lee, Ellen H. Schwartz. Directed by Denis Villeneuve. Screenplay, Taylor Sheridan. Camera (color, Arri Alexa HD, widescreen), Roger Deakins; editor, Joe Walker; music, Johan Johannsson; executive music producers, Tara Moross, Darren Blumenthal; production designer, Patrice Vermetter; supervising art director, Paul Kelly; art director, Bjarne Sletteland; set decorator, Jan Pascale; set designer, Ricardo Guillermo; costume designer, Renee April; sound (Dolby Digital), William Sarokin; sound designer, Tom Ozanich; supervising sound editor, Alan Robert Murray; re-recording mixers, John Reitz, Tom Ozanich; visual effects supervisor, Louis Morin; visual effects, Oblique FX, Fly Studio, Cinesite; special effects supervisor, Stan Blackwell; stunt coordinator, Keith Woulard; associate producer, Emma McGill; assistant director, Donald L. Sparks; casting, Francine Maisler.